You save 50% off RRP! The stem of the key is metal and the Pink Butterfly has lace like wings and is decorated with Diamante Crystals. The number 18 also features a little bling with inset Diamante Crystals. 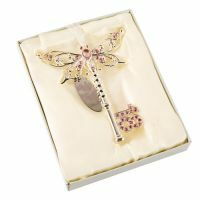 The key has a good weight (approx 90 grams) and has a hanging ribbon attached.